OAR PSNT - Vocations: Where are you? There are about 1,000 of us in the Order, which is divided into four provinces, spread over nineteen countries in four continents: Argentina, Brazil, Chile, China, Colombia, Costa Rica, Spain, United States, Philippines, Guatemala, England, Italy, Mexico, Panama, Peru, the Dominican Republic, Sierra Leone, Taiwan, and Venezuela. 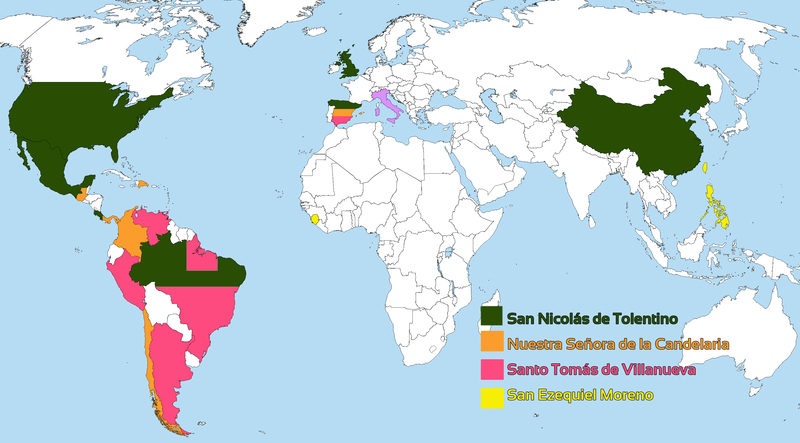 Presence of the Order of Augustinian Recollects in the world, and its component provinces. We belong to the province of St Nicholas of Tolentino. We can be found in seven countries: Brazil, China, Costa Rica, Spain, United States, England, and Mexico. Over 300 religious make up the province.